AC Electronics is dedicated to meeting all applicable environmental laws and regulations. Our ballasts and LED Drivers meet all US Federal and State environmental regulations. In addition, as of October 31, 2007, over 98% of our ballasts and drivers can also be manufactured to meet or exceed the stringent European Union Restriction of Hazardous Substances (RoHS) regulations, as applicable to electrical and electronic products. Please contact your AC Electronics' sales representative for information about your specific application. 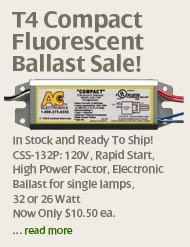 We will be happy to quickly provide you with the RoHS compliant ballast or LED driver that you need.